Coll. No. 1261, 29 Jul 2015, characters observed: Perennial herb, to 40 cm., long straight hairy to wooly throughout, eglandular; Leaves, basal and cauline, basal, compound, stipules, 18 mm., entire, petiole, 50 mm., blade, 50 mm. × 33 mm. wide, obovate, leaflets, #9, 23 mm. × 9 mm. wide, bases decurrent, margin, flat, toothed most of length; Inflorescence, cymose; Bractlets, 3 mm., slightly darker than calyx lobes; Calyx, lobes #5, 5 mm. ; Petals, #5, 5 mm. × 4 mm. wide, yellow; Ovary, glabrous; Style, 2 mm., widest at base; Fruit, achene, #10, 1.5 mm. × 1 mm. wide, brown, smooth, glabrous. Field Notes: Coll. No. 1261, 29 Jul 2015. 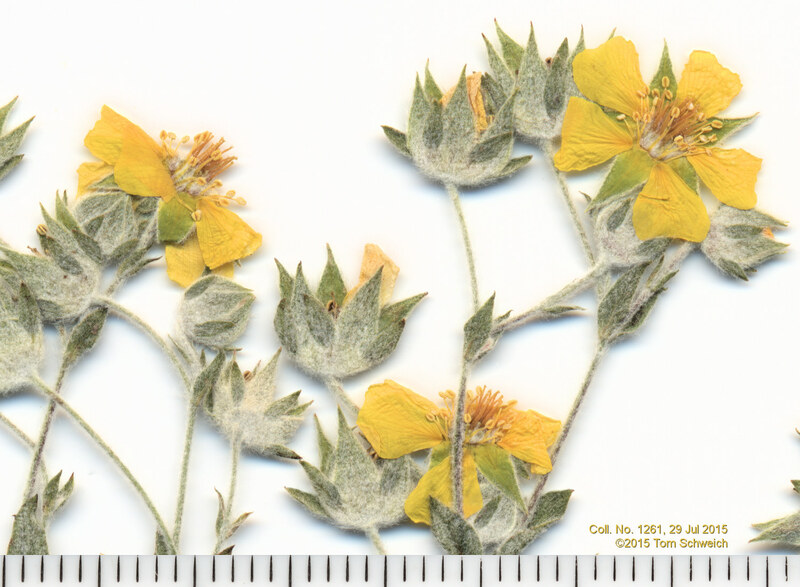 Other photos about Species - Rosaceae or Rosaceae Potentilla hippiana effusa.